Michael and Diane Porter wrote the following review, which appeared in the September, 2011, Bird Watcher's Digest. It discusses the necessary design principles of a binocular-camera. It also gives an in-depth look at the Bushnell Image-View SyncFocus binocular-camera. Paddling along in an Arkansas swamp, you raise your binoculars to catch a glimpse of a huge black-and-white woodpecker. Your camera, of course, is in its waterproof bag by your side, and by the time you get it out, aim, and focus, the bird is gone. If only your binoculars had a button that would capture what you see. 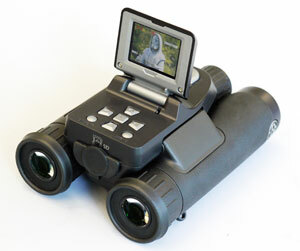 Birders would love such a hybrid device, a small, portable, roof-prism binocular with a built-in digital camera. Well, such a thing does exist. In this article we’ll take an in-depth look at a binocular-camera, the Bushnell Image-View SyncFocus. We chose this model as our example because it’s a top-of-the line product and has had good reviews from customers. The Bushnell SyncFocus is an 8 x 30mm, H-shaped, roof-prism binocular with a camera mounted between the two barrels. The lens of the camera forms a third barrel, shaped so it still lets you adjust the binocular to fit the distance between your eyes. While many other binocular-cameras have fixed-focus camera lenses, with the SyncFocus, the focus knob adjusts the camera lens and the binocular at the same time. Both the binocular and the camera lens will focus as close as 10 feet. It’s a compact device. It balances well in the hands and weighs only 14.8 ounces. Hold it up to your eyes, and your index finger falls naturally on the focus knob, while your middle finger rests on the “Snap” button, ready to take the picture. It’s not a bad ergonomic design, and it has a pleasing, streamlined look. At the top rear is a black, rectangular cover that opens to reveal a 1½-inch LCD display and seven small buttons that control the camera electronics. A rubberized flap on the back protects an easy-access slot for an SD card, a mini-USB port, and a socket to plug in the included wired-remote shutter release. The underside has a tripod socket and an easy-to-open battery compartment for two AAA batteries. The SyncFocus also comes with a soft case, neck strap, USB cable, and a tabletop tripod with flexible legs. There’s a Quick Start Guide, but the full user’s manual must be downloaded from the Internet. Although no SD card is included, the camera comes with 16 MB of built-in memory so you can at least try it out even if you don’t have an SD card handy. How good are the pictures?